Snow total map for Wednesday's storm. RAPID CITY, S.D. - A potent spring storm system will move across the region today through Thursday, bringing rain, snow, and gusty winds to the area. Rain will develop across the area today and this evening, then transition to snow late tonight into Wednesday morning. Very heavy snow will then continue through the area during the day Wednesday, gradually ending Wednesday night and Thursday. Breezy northerly winds will result in areas of blowing and drifting snow and significantly reduce visibility at times. On Thursday morning, winds will become strong with gusts up to 55 mph, mainly near and south of Interstate 90. This will result in extensive blowing and drifting of snow, resulting in zero visibility. Blizzard warnings encompass most of southwestern, central and eastern South Dakota. A Winter Storm Warning is up for northeast Wyoming and extreme western South Dakota. Sturgis is currently under the winter storm warning. 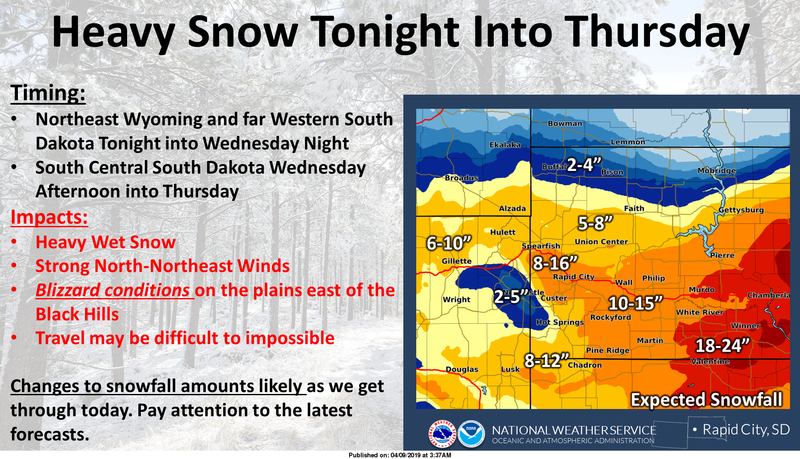 Eight to 16-inches of snow is forecasted along the I-90 corridor from the Wyoming State line down to Rapid City. Heaviest amounts are expected in south-central South Dakota where 18-24 inches could fall.